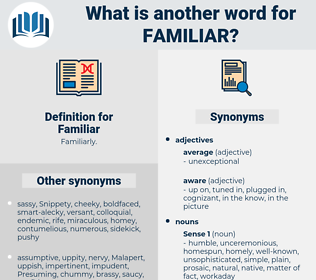 What is another word for Familiar? aware, famous, informed, colloquial, family-related, recognizable, usual, family-run, family-based, family-owned, popular, notorious, common, well-informed, renowned, experienced, well-recognized, customary, unaware, cognizant, well-established, conscious, normal, prominent, prevalent, unknown, similar, understanding, know, clear, mindful, regular, typical, celebrated, available, Family, well-publicized. conversant, knowledgeable, comfortable, commonplace, familial, knowledge, well-versed, proficient, intimate, habitual, abreast, acquaintance. distant, original, undistinguished, cold, extraordinary, abnormal, new, different, unfamiliar, unknowledgeable, unremarkable, unfriendly, alien, unknown, cool, uncommon, foreign, unusual, industrial, business, unacquainted, ignorant, aloof, strange, unapproachable, reserved. uncomfortable, stupid, loose, unsociable, unintelligent, unhappy. His face is so absolutely familiar. Could I ever know the meaning of those other words of his, 'The strange made familiar, ' as I did when I heard it in the sound of the stranger's voice?